One out of every 57 people in the United States will die from a disease that slowly steals your memories, your mobility, your learned behaviors (like how to talk, walk, write, use the bathroom or comb your hair), and all the things your body does on its own (like fighting an infection and swallowing food; eventually it stills your breathing and silences your heart). Your body forgets how to do everything. My Mom passed away four years ago from this egregious disease. She was 72. A wife to my Dad for 52 years. A mom to her 7 children. A grandma to her 15 grandchildren. She is sorely missed. 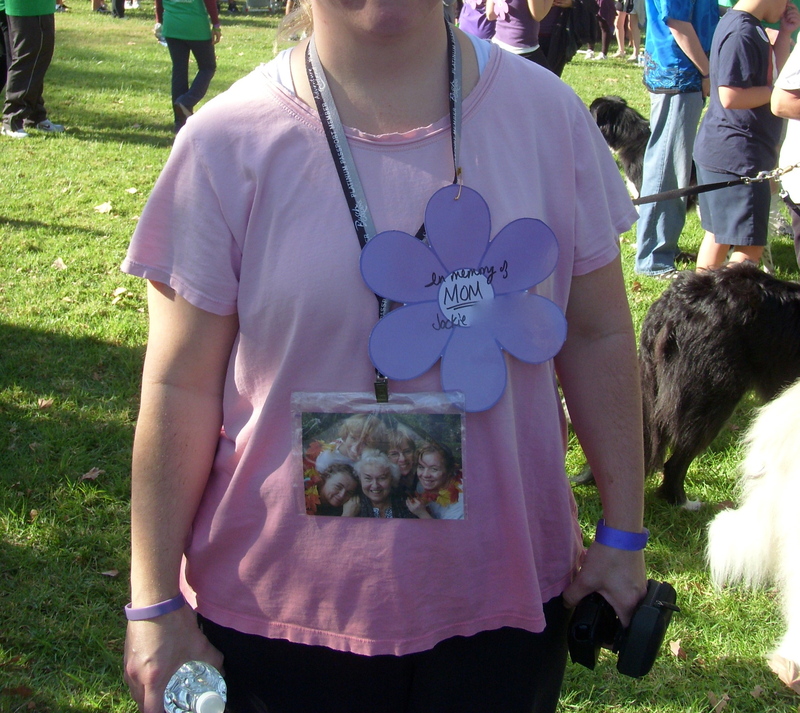 In her honor, my husband and I participated in a local Walk to End Alzheimer’s today (near our home in Southern California, a thousand miles away from my family of origin in Oregon). Mom was diagnosed in 2004 and passed away in 2007. It took me until 2011 to join the cause. I’m not mad at myself for not getting involved sooner; just perplexed at what took me so long. Perhaps it was my extremely sedentary lifestyle. Doing any kind of walking was the last thing on my mind. Perhaps it was my fear of asking people for money, even if it was for a good cause. 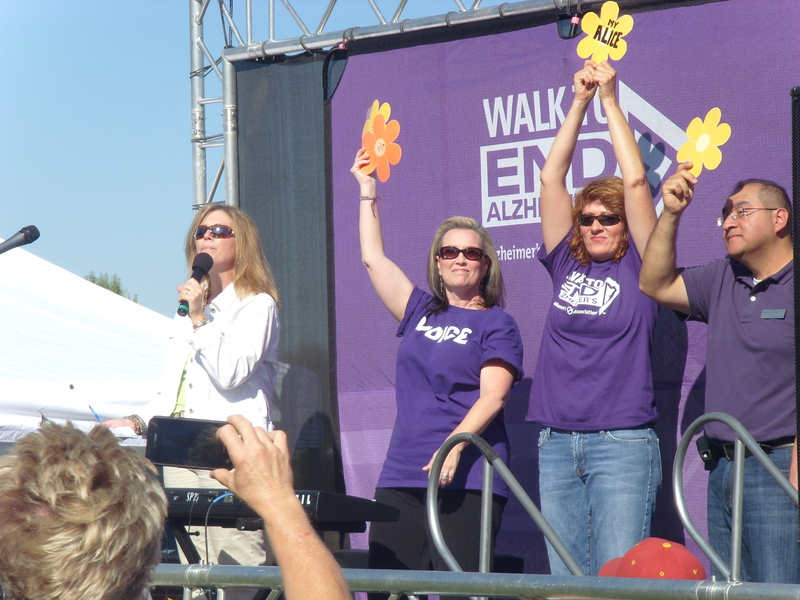 Now that I’ve become more physically active, participating in the Walk to End Alzheimer’s was something I had to do. My husband and I together created a team of two. We arrived a little later than planned so we had to park in a dusty field next to the park. We checked in and received purple wristbands. Because we had raised over $100, we received a ticket to pick up a purple Walk to End Alzheimer’s t-shirt. I was bummed to discover they were out of all t-shirts except size small, but we put our name down to receive one in the mail later. Was it an honor to write my Mom’s name down? No. It was sad. But it was an acknowledgement of her. That I was there today because of her. That she lived. That she was missed. That she mattered. A lot. I pinned the flower on to a lanyard I wore around my neck, which was holding a photo of my Mom with her four daughters. It’s one of my favorite family photos, even if it doesn’t include my Dad and three brothers. My Mom had just been diagnosed and we were cherishing and loving all over her. I looked at the flowers other people wore and wondered what their stories were. Of the vastness of their pain and loss. Of how great their love for each other. Nearby there were tables full of coffee, bottled water and snacks: granola bars, fruit leather, crackers and muffins. High school kids wearing volunteer t-shirts manned the tables. I asked one of the kids where they were from. She was part of the Volunteer Club at a local high school. Wow. How cool is that? Across the grass were several booths with representatives from retirement homes, assisted care facilities, funeral planning, and the Alzheimer’s Association. A couple of Lakers cheerlead ers were on hand to autograph Lakers team photos. There was an opening ceremony, during which the speaker had everyone in the crowd hold up their laminated paper flowers to create a special “garden.” Later, a young lady sang a beautiful song she wrote for her grandma. Then the walk officially began. 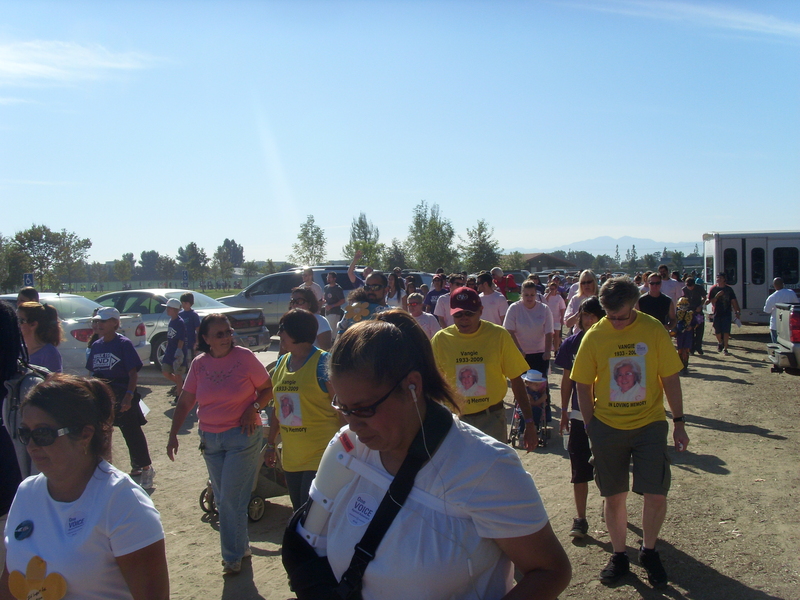 It was slow going as there were lots of dogs, little kids, and elderly folks participating in the walk. The high school student volunteers held directional signage and cheered us all on as we passed them. They made me smile. It was a two-mile walk but felt much shorter, and was anticlimactic at the end. People just strolled directly to their cars and that was that. 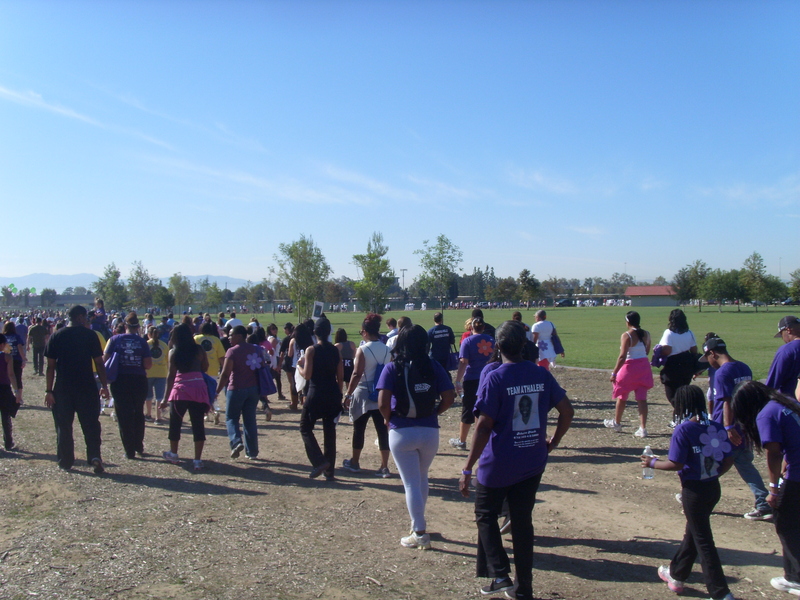 The entire event was extremely well organized, both before and during the event. A plethora of tools were provided to help participants raise money: email blasts, Facebook posts, snail-mail letter templates. Lots of encouraging reminders were sent to me before the event. I had my own personalized donation web page where my friends and family could go give a secure donation. When I got home after the walk, I’d already received a “thank you” email. It was a fantastic operation. 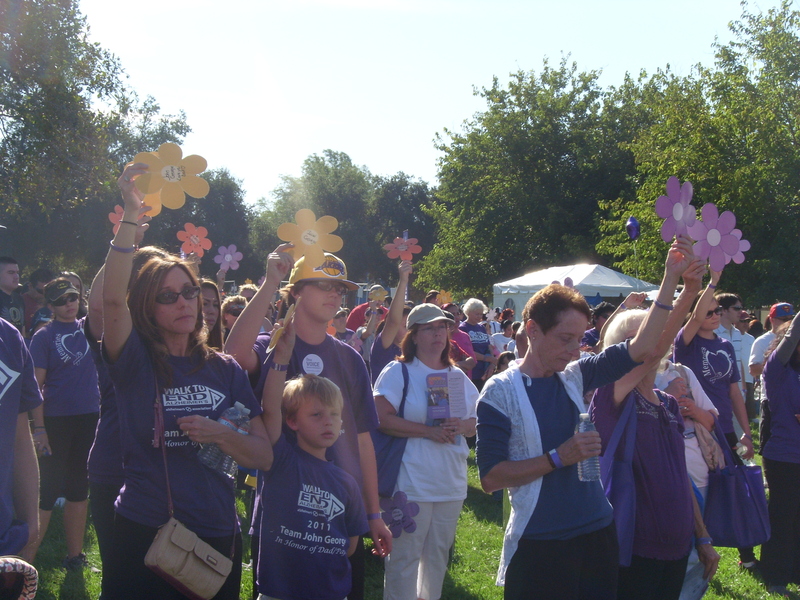 I was totally impressed by the professionalism and organization of the Alzheimer’s Association. “How much further?” I asked, gasping for breath. My feet felt like lead. “It’s just around the next bend,” my friend replied. We made it around the next bend, then the next, then the next. “Are we almost there?” I asked again, practically begging. “Almost,” he replied, smiling over his shoulder. We plodded on. I thought about the car keys in my pocket. The good novel in my daypack. 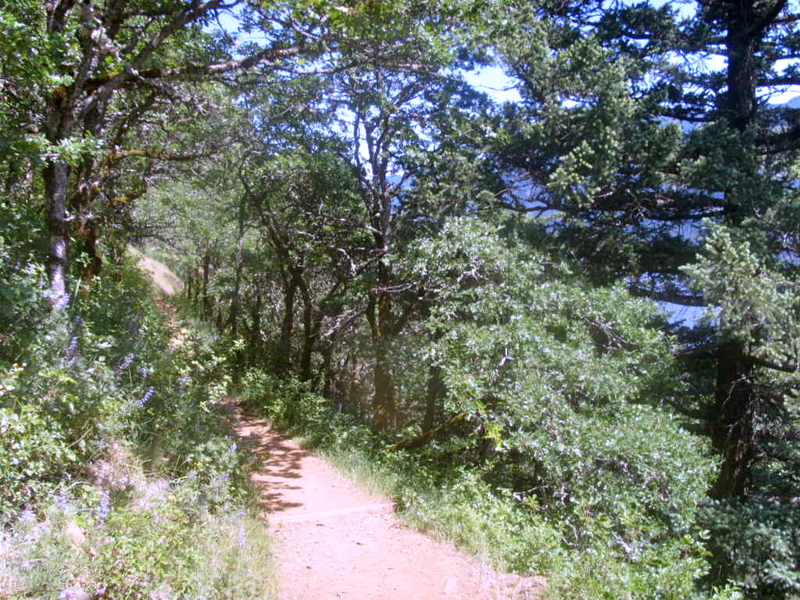 I could so easily turn around, head back down the trail, and wait for my friends to complete the hike without me. The knowledge that I could flake out at any time somehow kept me from quitting. Other than my muscles screaming in protest and my lungs burning from desperately sucking in air, I was having a good time. Two years ago, serendipity placed me there on Dog Mountain in Washington state with my sister Teri and long-time friends Rob and Kim. I had warned them ahead of time that I was completely out of shape, and the only exercise I’d been doing back home in southern California was water aerobics. They didn’t mind. They said they’d take it slow and stop whenever I needed to. Early that morning, I should have known I was in over my head after we parked the car, donned our daypacks, and walked uphill to the restrooms near the trailhead. I was already gasping for breath. It was 3.8 miles to the top of the mountain. The hike was rated strenuous/difficult. The elevation gain was 2,850 feet. My desire to spend time with these three much-loved people outweighed my trepidation. The trail was quiet and peaceful. As we walked among regal Douglas fir trees, the Columbia River winked at us through the branches. At almost every switchback, I stopped to catch my breath while my three companions waited patiently. They chatted comfortably while I concentrated on trying to get oxygen into my body. With their patience and support, I stuck it out all the way to the top of the mountain. This was the view that awaited us. Breathtaking. Worth every gasping breath up that trail. It was a perfect, sunny day in May. Wildflowers carpeted the alpine meadow. The Columbia River in all its glory was laid out before us. The summits of Mt. Hood and Mt. St. Helens peeked at us from among the lesser mountains of the Cascade Range. It was a memorable, life-affirming day. Besides having a grand adventure with old friends, I learned that I am capable of so much more than I give myself credit for. I didn’t quit. The sense of accomplishment was incredible. I am about 30% toward my goal of losing 95 pounds. As I mentioned in Baggy Pants are Big Fat Liars, I have been slighly tempted to stay where I’m at right now, even though there are clues of much greater things ahead. I feel so much better than I did 30 pounds ago. I feel fantastic. But I haven’t reached my summit. Not even close. What a loss it would be if I were to flake out now. I can do this. 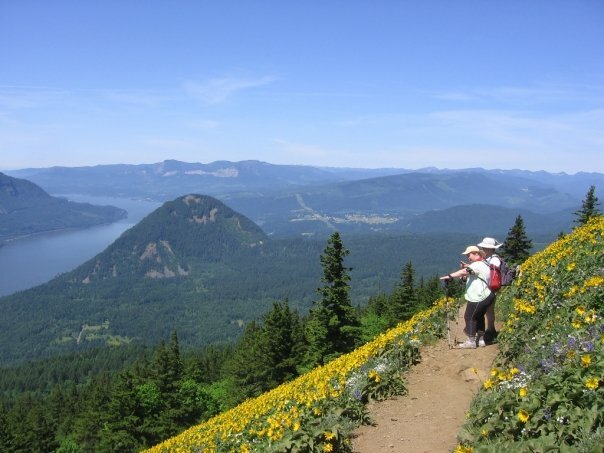 To give myself a tangible goal to work toward, I’m planning another hike up Dog Mountain next May with these friends. I will be lighter and much more fit. I will conquer that mountain in a whole new way. Tell me about your Dog Mountain. Have you accomplished something you never imagined yourself capable of doing?